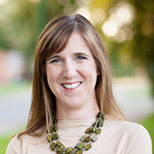 Jessica Hellmann is the director of the Institute on the Environment at the University of Minnesota and the Russell M. and Elizabeth M. Bennett Chair in Excellence in the Department of Ecology, Evolution and Behavior in the College of Biological Sciences. research focuses on global change ecology and climate adaptation. She was among the first to propose and study ways to reduce the impact of climate change through new techniques in conservation management. Hellmann led an important paradigm shift in ecology and natural resource management by showing that adaptation — living with climate change — is just as crucial to the future of humanity and Earth’s ecosystems as slowing and stopping greenhouse gas emissions. She is a frequent contributor to leading scientific journals such as Proceedings of the National Academies of Science, Frontiers in Ecology and the Environment, BioScience and PLOS ONE. She serves on the editorial board of the journal Evolutionary Applications, is an associate editor with both Conservation Biology and Elementa, and serves on committees for the Ecological Society of America, the College Board and the National Academy of Sciences.